Like I said in my previous posts, we had three main reasons why we wanted to visit Bangkok: temples, food and shopping. I have finished writing my posts about the temples so let us move on to the food. 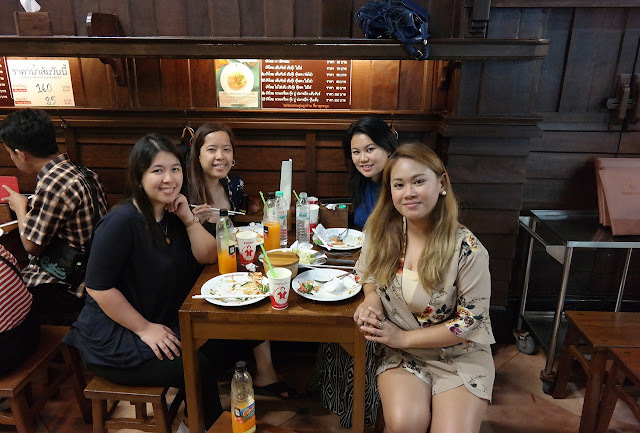 Most of our stay in Bangkok we just ate wherever hunger striked. There is only one place that we specifically put in our itinerary under the category of food: Thipsamai. Thipsamai was recommended by our friend's brother who told her that we definitely and must visit it. Why? Because Thipsamai is hailed as the best pad thai is the whole of Bangkok, if not Thailand. Many major media and publications around the world including CNN, TIME Magazine and BBC. Thipsamai is also a Michelin Starred restaurant btw. 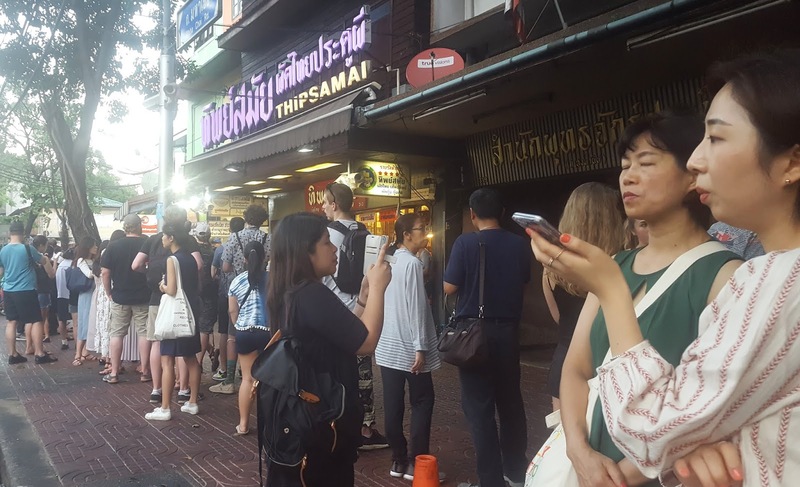 So the buzz about it is another reason why the queue outside it reaches almost the next block. Pad Thai or "Fried noodles" has its roots during World War II. Field Marshal P. Pibulsongkram Prime Minister, in those days, want to have nationalism. This brought forth the idea to create a national food. With the fact that rice is expensive, he wanted to turn to noodles for replacement and also to use use local raw materials. With its unique taste makes it a perfect dish and quickly spread. The Thai people then called it "Pad Thai". That also marked the beginning of Thipsamai. Their customers named them “Pad Thai Pra-Too-Pee” because the small restaurant is nearby Pra-Too-Pee intercsection in the center of Bangkok. The name has been changed to Thipsamai in 1966. With the long history of more than a half century, they have been standing together with the Thai people through every crucial and critical event. Thipsamai has become very famous because they always have a concern about the quality and freshness of the ingredients of the pad thai. Their pad thai is the current model and standard of many leading restaurants both in Thailand and around the world. We ordered their Superb Pad Thai and Pad Thai with Shrimp. The Superb Pad Thai is a combination of long and tender Chan noodle, shrimp oil and wrapped with egg. It is seasoned with special herbs together with an addition of fresh deep sea prawns while it’s being cooked on a charcoal stove. The Pad Thai with Shrimp is almost exactly the same as the Super Pad Thai. The difference is that they add the egg and cook it together with the other ingredients and the noodles. I love that the taste is brought about only by what is the original ingredients in the plain pad thai. It’s up to you to add more to it, like if you want that sour taste of other pad thais, you can squeeze some lime on it, add more bean sprouts, spring onions and banana flower. On each table inside the restaurant, you will find a huge container with ground peanuts in it. This is where I went gaga. I put like 4 spoonsful of peanuts on my pad thai. As for the drinks, they offer water and their freshly squeezed orange juice. Surapong’s Fresh Orange Juice is produced from selected orange with juicy orange pulp with no additional artificial color and preservatives added. This gives you the deliciousness of 100% natural taste of orange juice. This was the priciest thing on their menu but we had no choice but to order it since they run out of water. The queue might be long but don’t get intimidated as it moves on a reasonable phase. And for 90 Baht, you get the best tasting Pad Thai you’ll probably taste your entire life. Thipsamai is worth the visit and I hope to go back here whenever I return to Bangkok.